Cooking a rib eye steak and vegetable on a grill. Ribeye is one of the more desirable cuts of beef on the market. Some would argue it is the ultimate cut of beef, but that falls into the realm of the purely subjective. It is a superbly marbled cut that tends to render -- if properly prepared -- a juicy, tender steak time and time again. 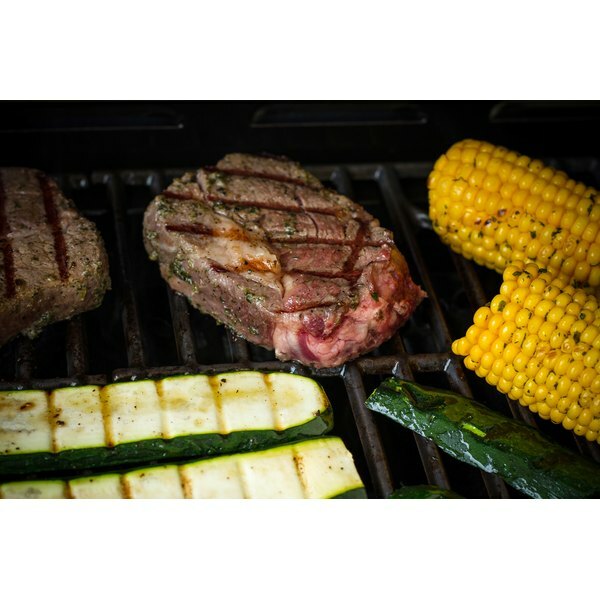 While its marbling makes it a prime cut for the grill, this recipe provides both the convenience and flavoring of pan-frying. When served with a baked potato and steamed vegetables, the ribeye becomes more than a meal – it becomes an occasion. Preheat a cast iron or oven-safe sauté pan in the oven at 500 degrees F for 20 minutes. Place the ribeye on a plate and allow it to come to room temperature. Room temperature steaks cook quickly and more evenly. Carefully remove the heated skillet or saute pan and place it on the stovetop over high heat. Do not turn off the oven. Coat the ribeye with canola oil and season it with salt and pepper. Carefully lay the steak in the middle of the skillet. Allow the ribeye to cook for 30 seconds before you turn it. This sears a crispy layer onto the steak. Using cooking tongs, turn the steak over and sear it for another 30 seconds. Slide the skillet into the oven and cook for two minutes. Turn the steak and cook for two more minutes. Remove it from the oven, remove it from the skillet , and place it on a cool plate. Allow the steak to rest for approximately 15 minutes. Serve warm and do not slice it until you are ready to eat -- at least 10 minutes. If you prefer a medium done steak, add one minute to the oven cooking times. 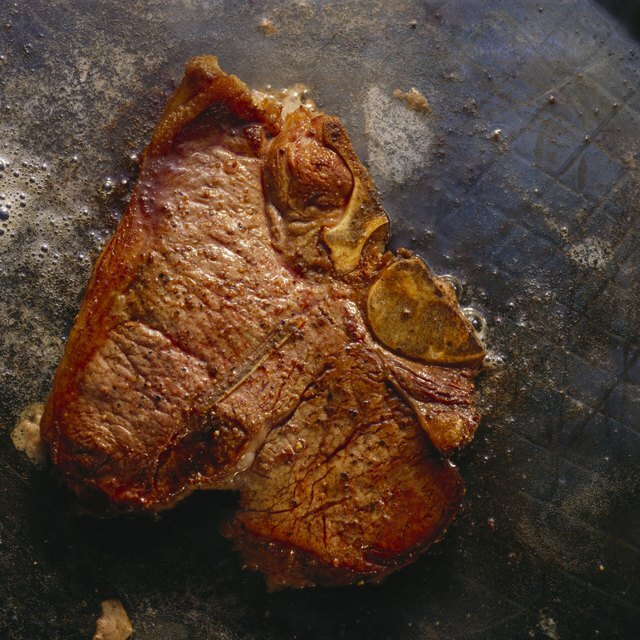 Ribeye loses its flavor if overly cooked, so avoid cooking it well done.